Drager has built its reputation upon supplying technically advanced products that are of the highest quality. In fact, the name Drager is synonymous with safety. The Saver range of Emergency Escape Breathing Apparatus adopts these principles to give you complete peace of mind. This means that if and when you need it, you'll be guaranteed that the Saver PP will carry out its task effectively and efficiently. Above all, it will provide the wearer with the utmost in respiratory protection. The Saver PP has evolved through a combination of technical refinement and customer consultation. A positive pressure Emergency Escape Breathing Apparatus has been developed using leading edge technology. Essentially, it's been designed to provide safe and unhampered escape from hazardous environments where breathing has become difficult or endangered. The same pneumatic principles that are used on the PA90 plus, have been adapted for use throughout the Saver range. This provides extremely low breathing resistance and a consistent air flow rate at all cylinder pressure levels. The unit is activated when the carrying system is opened. It can be simply re-set in the event of false alarm. The unit is contained in an instantly recognisable orange carrying bag, incorporating photoluminescent panels. This allows the unit to be seen at very low ambient light and visibility levels. The pressure gauge can be inspected without any dismantling or adjustments to the unit, due to a transparent viewing window located on the outside of the bag. This allows for quick and simple low cylinder contents checks. The cylinder can be charged using standard charging connectors with no special tools or adaptors. The Saver PP has been especially designed to be used in conjunction with other forms of Personal Protective Equipment like safety helmets and ear protectors, with little or no encumbrance. Utilises the Drager balanced first stage reducer with excellent flow characteristics. The positive pressure Lung Demand Valve has a balanced piston design, is first breath activated and extremely quiet in use. The Saver PP comes equipped with the Panorama Nova facemask, providing low exhalation resistance, a close and comfortable fit and a self demisting visor for clear vision. The high visibility orange carrying bag incorporates photoluminescent panels, is interchangeable for either chestbag or bandolier wearing positions. It's also washable, flame retardant and waterproof. 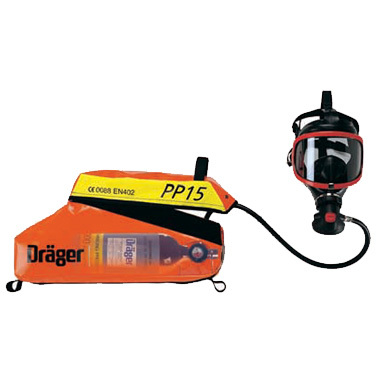 The Drager Saver PP provides breathing air for 10 or 15 minutes, according to cylinder size and is fully approved to EN402. No mandatory routine service is required for a period of 10 years. The Saver PP is extremely compact in design providing greater freedom of movement.